In 2018 and beyond, ads should be a part of every SMBs’ inbound marketing strategy. Ads allow you to be extremely targeted with your marketing, and engage your customers where they are already spending time online, turning prospects into loyal customers. It's for this reason that we're bringing HubSpot's ads tools to the core Marketing Hub --- giving it to all Marketing Hub Professional & Enterprise users. By adding HubSpot’s ads tools into the core Marketing Hub, you'll now have one place to evaluate the performance of all your ad spend -- agnostic of network and directly alongside the rest of your marketing efforts. You'll also easily be able to see exactly how your ads are influencing your bottom line, with ROI reporting that simply doesn’t exist within the networks. Most importantly, by running your ads through HubSpot, you get unique insight into your customer journey. Taking data from your website, social, email, and CRM, you get truly unique targeting and retargeting options. With HubSpot, you can align your ads with the rest of your marketing efforts and create a consistent narrative across any touchpoint someone has with your company. All Marketing Hub Professional and Enterprise customers now have most of the features that were previously in the ads add-on. The ads add-on will transition into a "capacity pack" add-on at the same $100/month price point. This add-on will give you increased ad spend, increased audiences synced, faster audience sync times, and can be purchased as many times as needed to meet your advertising needs. The above is accurate as of 12/3/2018. For the most up to date information regarding our ads feature set, feel free to check out our product catalog. If you're a marketer that is focused on helping your customers move through their buying journey, you should be incorporating ads into your marketing campaigns. 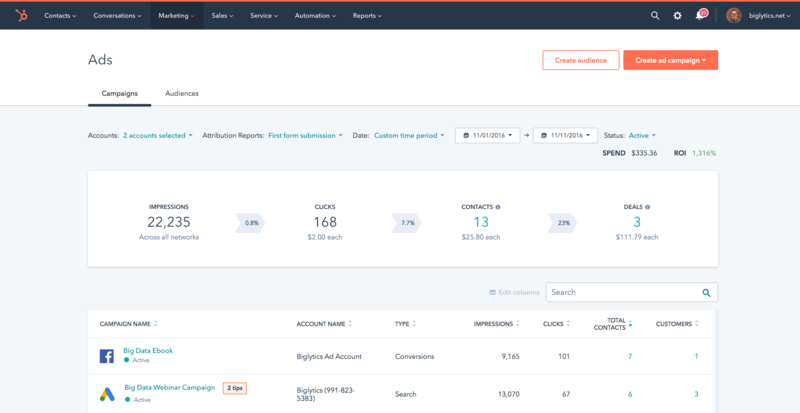 To help Marketing Hub Professional and Enterprise customers realize the full potential of running their ads through HubSpot, all of these features are now available within your account.